Wednesday Wrap: Star Wars Sky remotes, Pryma headphones, SoundCloud on Raumfeld and more | What Hi-Fi? From the news that new brand Pryma has released its first pair of headphones in collaboration with Sonus Faber, to Apple selling the Devialet Phantom in selected US stores and Raumfeld bringing SoundCloud integration to its multi-room speakers - it's What Hi-Fi? 's Wednesday Wrap. New brand Pryma - a sister company of Sonus Faber - has launched its first product, the Pryma 01 headphones. It aims to deliver a high-quality sound with a fashionable look. The headphones have been made in collaboration with Sonus Faber, with the Italian speaker manufacturer taking responsibility for the sound. 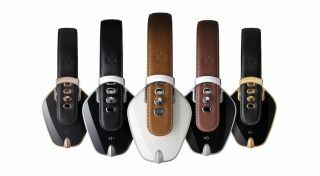 The headphones feature interchangeable leather headbands with belt-style buckles made from copper and stainless steel. The ear cups are made from aluminium and coated with a 'fingerprint-free' material. The headphones are available in coffee & cream, pure black, heavy gold and rose gold & grey, and for £380, while a carbon masala version is available for a £30 premium. They're on sale in the UK in Selfridges. Raumfeld has announced that owners of its wireless multi-room speakers will be able to access SoundCloud through its app. SoundCloud integration will arrive later this month, allowing users to gain access to “unique and exclusive content from musicians, DJs and sound designers". Raumfeld says it's the first of many music streaming services to be added to its multi-room speakers. To coincide with the release of the six-film Star Wars saga on Sky Movies, Sky has launched ten new remote controls. They feature Darth Vader, C-3PO, Han Solo, R2-D2 and Princess Leia. Sky will also launch a new Sky Movies Star Wars channel, 304, which will be available from 11th December to 3rd January. Star Wars: The Force Awakens is of course set for release in cinemas - including IMAX and Dolby Cinema - on 17th December. If you like listening to music using in-ear headphones and enjoy having something round your wrist, the new Wraps headphones are for you (or maybe just your kids). Designed by British Audio Industries, the headphones feature a 'patented slider system' that keep the earpieces, slider and jack plug connected so they don’t fall off once wrapped around your wrist. There's no word on how they ensure the cable doesn't get damaged, though there is a step-by-step guide on how to wear them properly on the Wraps website. The earphones are available in a range of colours and styles with prices ranging from £15 to £25, depending on the strap. Good news for audiophiles on the other side of the Atlantic, with the news that Devialet products are now being stocked in Apple Stores. The top 14 Apple Stores in the US have begun selling the Devialet Phantom and Silver Phantom. Both speakers will retail for the same price as buying through Devialet direct: $1990 for the Phantom and $2390 for the Silver Phantom.